We’re pleased to announce that our Coop Community Champion application has made the final shortlist to be put forward for voting. The voting will take place at their Members Evenings and also online. 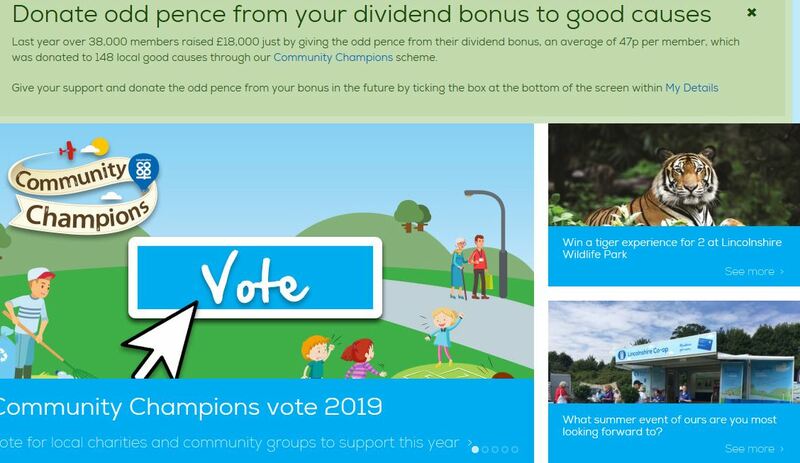 Please visit https://www.lincolnshire.coop/ and sign in to your account and select ‘Community Champions Vote 2019’ and select Holbeach and East Elloe Hospital Trust to vote for us. 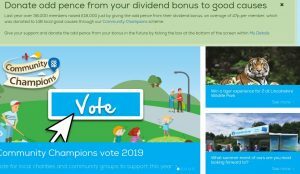 If we are selected every time you shop and use your dividend card, Lincolnshire Coop will give a donation to us for the period of one quarter. Voting closes 12th April and each member can only vote once. Please let your friends and family know as every vote is important. We would like to say a big thank you to the wonderful Moulton Ladies Group, who very kindly presented us with a cheque for £100. The Ladies Group also made donations to six other charities at a special presentation evening. The seven charities included Abbeygate Care Home, Moulton Community Centre, Holbeach and East Elloe Hospital Trust, Mia Clucas Charity, The Moulton Mill, St Barnabas Hospice and Tonic Health. 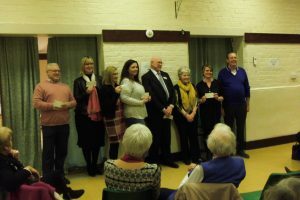 Each charity gave a presentation on their charity before being presented with a £100 donation. We would like to thank Moulton Ladies Group and everyone who was involved in their fundraising efforts; it is very much appreciated and the donation will be put towards creating a new Hobby Lounge for our residents. Residents, their families and staff were treated to an afternoon of musical talent from local artist Travis Graham. 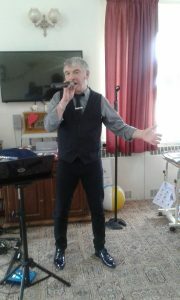 Travis sang a variety of songs and handed out Valentine’s hearts to residents. The entertainment was paid for by a generous donation from a family. The gardens and patio area at the rear of Holbeach Hospital are in great need of redevelopment and as part of our 30th year anniversary celebrations this year we would like to upgrade this area to include raised beds and a raised pond to make it easier for wheelchair bound residents to enjoy the plants and do a little gardening. 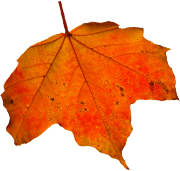 We think this is especially important for our end of life residents to be able to spend some time outside and make their last days special. 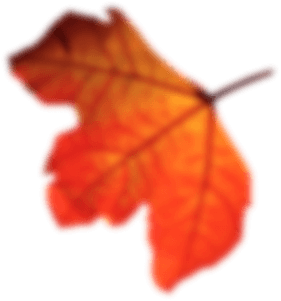 We already have some funds available but still need to raise additional funds to cover the total costs of the project. If anyone or any business is able to donate there are various ways – send a cheque addressed to “Holbeach and East Elloe Hospital Trust” please send with a letter or card stating it is for the Garden Renovation Appeal, or by popping to reception and we will be happy to take any cash, card or cheque donations, or you can call 01406 422283 Mon-Fri 9-3pm and we can take card payments over the telephone (again please state the donation is for the Garden Appeal). Many thanks for considering our appeal and thank you to those who have already donated. 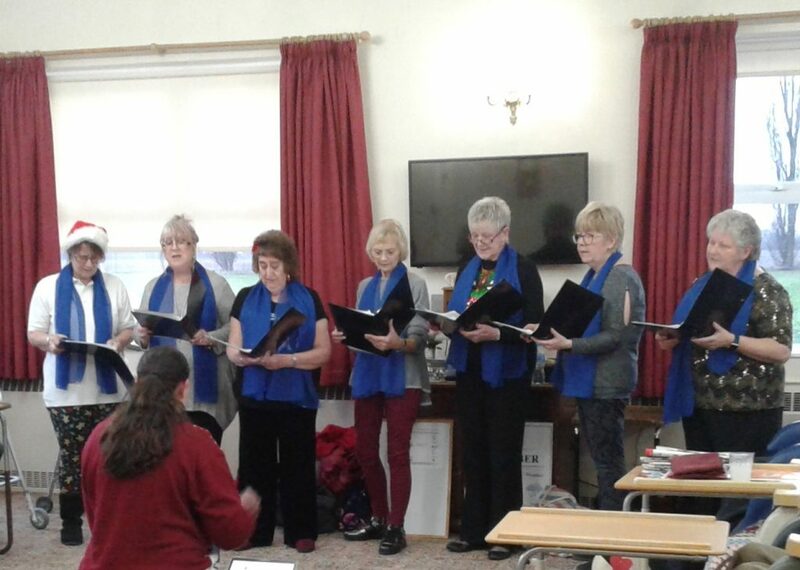 Just before Christmas, we had the pleasure of listening to Inspire Choir. Organised by Hannah Wickham, owner of Inspire Music School, the choir came to sing a mixture of Christmas songs and normal songs to lift everyone’s spirits and spread some Christmas cheer. Thank you Inspire Choir, we really enjoyed listening to you and it was a real treat. Eight new bedrooms have now been created and already have their first residents. The building work has been ongoing since the end of last year and involved the conversion of some old clinical rooms and the creation of new bedrooms upstairs. Manager Maxine Winch, commented “Our aim has been to offer more beds for use by the local community and to meet the ever-changing needs of the community we operate in. I am very grateful for how all of our staff, residents and their families have dealt with the necessary disruption and thank them for their patience during the building work. 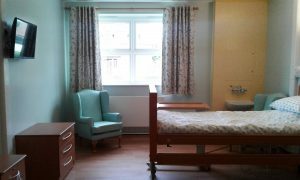 The new bedrooms are built to a very high specification thanks to the work of building contractors D Brown.” Three of the new bedrooms have been furnished thanks to money donated by the Hospital’s League of Friends. The eight new bedrooms will be a mixture of re-ablement (rehabilitation) beds and nursing home beds. 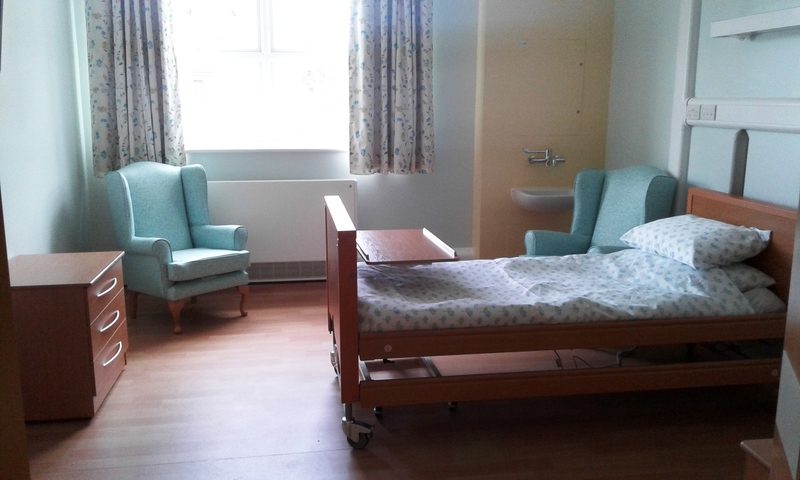 The rehabilitation beds are a new concept, where the hospital is working with the NHS to provide beds for people who are in need of rehabilitation or assessment before returning home from primary care hospitals. The residents are cared for by Holbeach Hospital but supported with Physiotherapy and Occupational Therapy teams provided by the NHS. Chair of Directors, Chris Penney remarked that, “the new rooms are an additional asset to the community and were full within a week of opening. 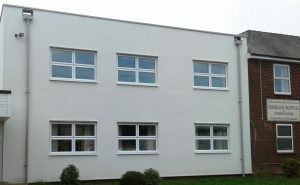 It is important that Holbeach Hospital remains sustainable in the future and these new bedrooms will assist with that. 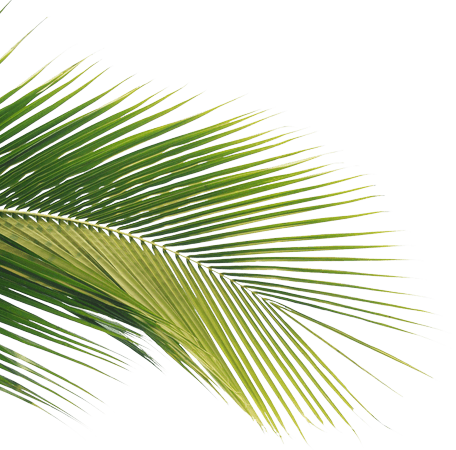 But we must not stand still; we still need to do more to ensure our future sustainability. I would like to acknowledge on behalf of my fellow directors a benefactor who has contributed a significant proportion of the funding for this project. 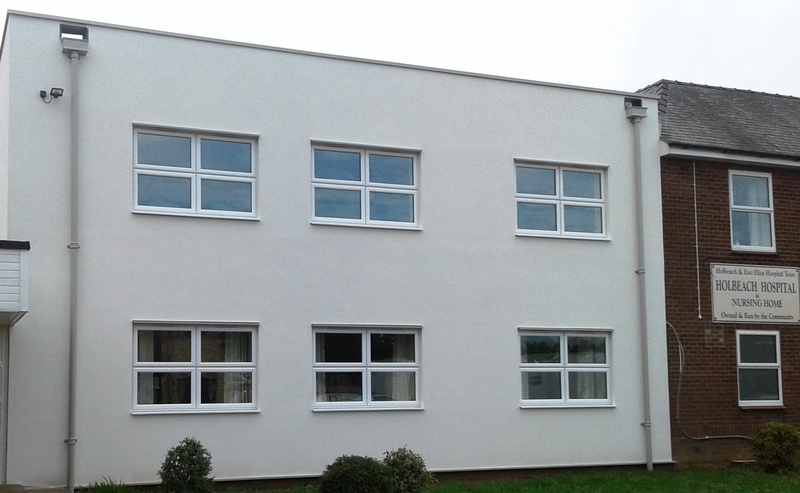 The building work has highlighted that we need an ongoing programme of building work to upgrade the existing ageing building to bring it in line with changing standards.” Holbeach Hospital is a registered charity and donations are always welcome. Holbeach Hospital currently have a waiting list in operation for nursing home beds – if you would like to add your relative to the waiting list please email info@holbeach-hospital.org.uk. 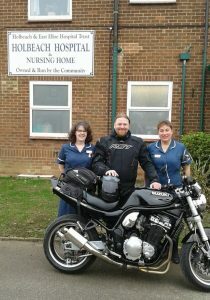 Holbeach and East Elloe Hospital Trust is owned and run by the community. After it was threatened with closure in 1988, local community leaders came together to raise funds to keep the facility open. The Trust provides beds for use by local doctors, nursing and residential home beds as well as reablement beds. 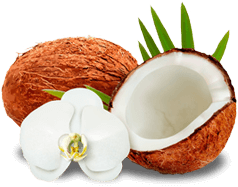 We also have our own Physiotherapy clinic and have a visiting Warfarin clinic. 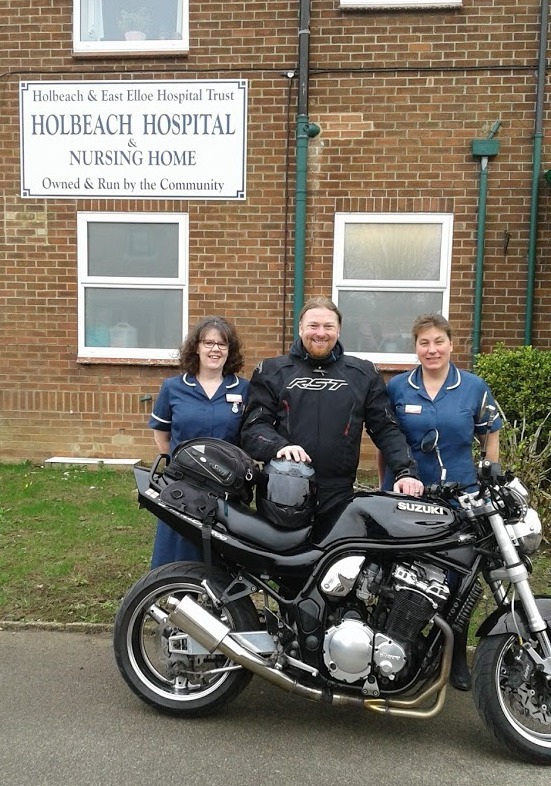 The people of Holbeach saved their hospital and provided a resource which continues to grow as we undergo expansion. 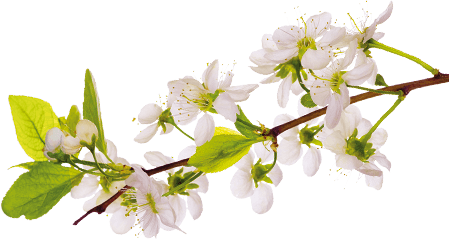 Compassion and a constant spirit of empathy are at the heart of everything we do. 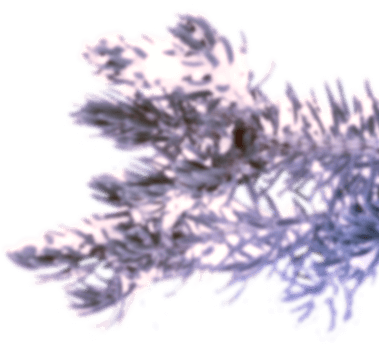 2019 will be our 30th anniversary of being run by the community, having officially closed in March 1989 and reopened in September of the same year. We are planning several celebrations in 2019 to mark the occasion. 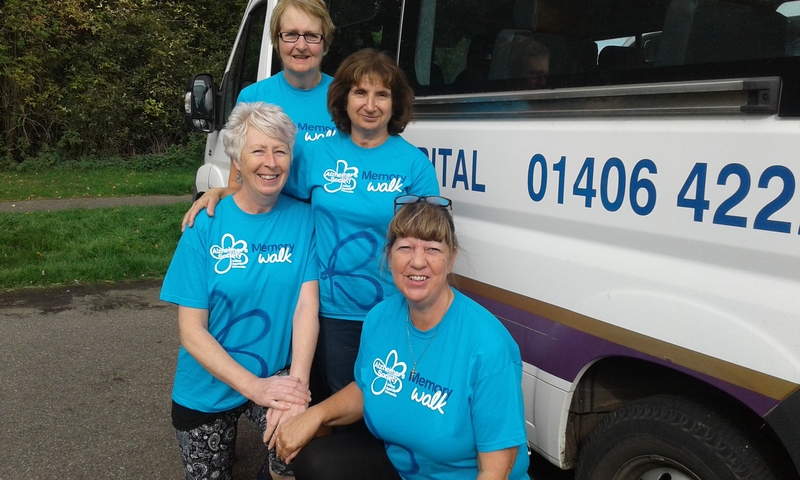 Congratulations to our team “Holbeach Happy Feet” who completed the Memory Walk in Peterborough on 16th September and raised lots of money for the Alzheimer’s Society.